The problem is that such an attitude may affect my health. It may lead to foolish choices, and it won’t garner any respect from others. Also, it isn’t likely to change the attitude of the offender. In other words, a bitter attitude may be a waste of time. For my own health, safety and sanity, I should choose to let go of bitterness. Forgiveness is likely to keep mental and physical darkness out of our bodies. It promotes peace within our hearts, if not our relationships. Peace is clarifying and healing. This is an accepted fact across most systems of belief. On the other hand, bitterness can drag us down. It can lead us into the depths of despair, if we aren’t careful. At that point, it may cause disease in our minds and bodies. We can choose to forgive our offender for the sake of our health. I’m not saying the road will be easy. Obviously, there are some cases in which immediately forgiving someone who has wronged us may be impractical. 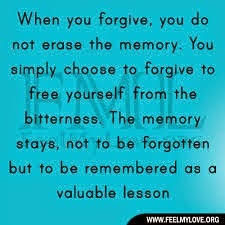 However, if the option of forgiveness is feasible, we should take it. 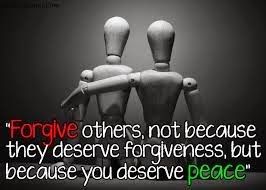 Forgiveness often benefits the person that is doing the forgiving more than it benefits the person that is being forgiven. Just as internalizing trash talk can be unhealthy, bitterness is unhealthy. Resentment is a catalyst to stress. On the other hand, medical research suggests that letting go of bitterness can reduce stress. When we reduce tension, we reduce the possibility of disease in the mind and the body. Mercy can help to keep a person’s mind free from the darkness that bitterness can bring. The offending person may not perceive any immediate adverse circumstances in his own life. He may remain unaffected and uncaring. However, if the victim is still able to let go of the offense for his own sake, he won’t derail himself from the tracks of mental and physical health. For example, the victim may be able to stop ulcers, depression, chronic anxiety, addictions, high blood pressure, intestinal distress, and a myriad of other ailments. Isn’t staying healthy more important than reliving the past? To quote a popular maxim, if we don’t have our health, what do we have? Forgiveness benefits us by calming us. A peaceful mind and body is a poor breeding ground for disease. It’s that simple. Really! How has forgiveness helped you?